Currently, users are presented with "Move to tab", "Archive", "Mark as read", and "Delete". With this update, a lot more options will be available, including replying, forwarding, and muting. For a service as versatile as Gmail, the right-click context menu has been rather sparsely populated, with just four actions available. Today, that changes. 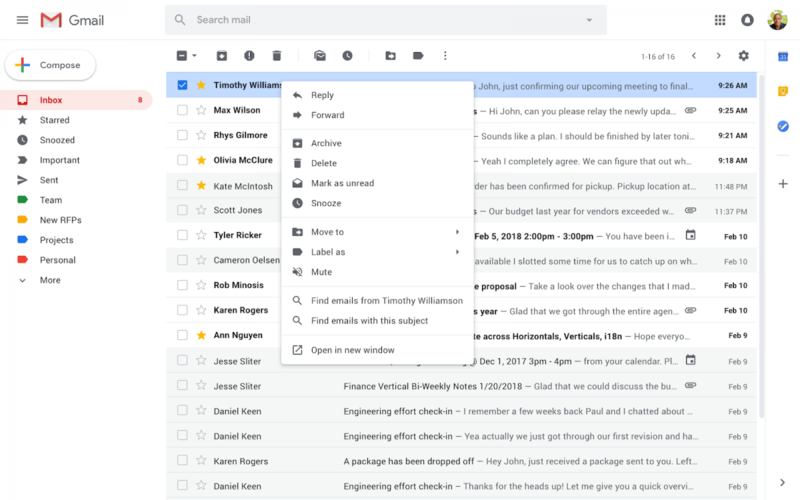 Google is making changes to Gmail in G Suite to roll out right-click menus to everyone, and it's happening quickly. The feature will likely take a few weeks before it arrives for everyone, but it's certainly worth the wait. Once the change lands, it is possible to use often used actions such as reply directly from the list of emails; something that has not been possible before using the user interface, if I'm not mistaken. Additionally, users can search for all emails from a sender or, if they have conversation view turned off, search for all emails with the same subject. Gmail's right-click menu is not particularly useful at this point in time as it provides only a handful of options. You'll also be able to use Control and Click on a Mac and the Windows key in Windows. End users can use the feature by simply right clicking on a conversation or mail to get the new options. For users of Gmail and G Suite on a rapid release schedule, the rollout started on February 11 and will take a full 15 days to hit everyone.